By now you’ve heard Autodesk talk a lot about the convergence of industries – design, construction and manufacturing. This year at Autodesk University Las Vegas, we’re demonstrating the future of industrialized construction and showcasing how we’ve been working with the construction industry to imagine and explore what can be gained by adopting manufacturing principles and practices. We created a large-scale additive manufacturing “toolbox” for the construction industry. We combined the power of two Panasonic TS-950 robots with the portability of a shipping container that can be deployed on a construction site. 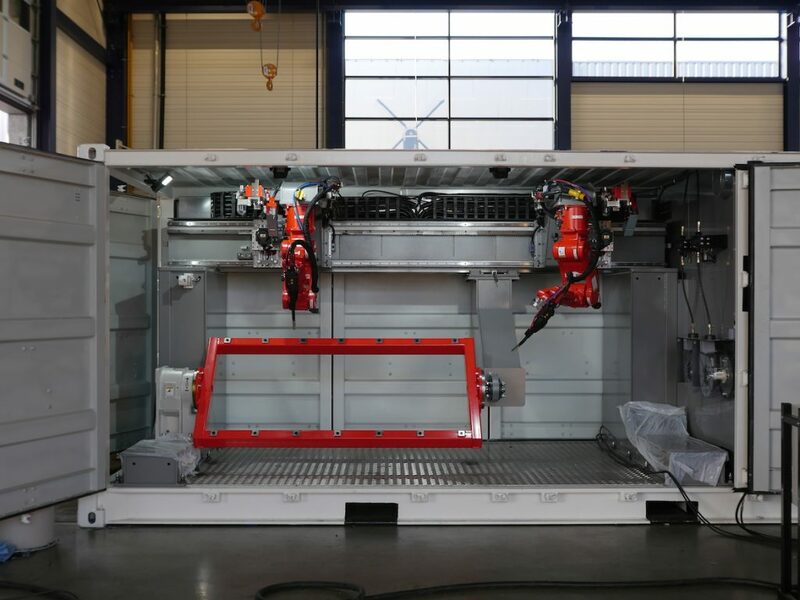 The Valk Welding group from The Netherlands supplied the robots for directed energy deposition (DED), a form of additive manufacturing to produce large, strong and usable metal components. Construction and manufacturing professionals are seeking better, more efficient ways to design and build the world around us, and there is much to be gained by approaching construction with a manufacturing mindset. With the world population expected to hit 10 billion in just over thirty years, mounting effects of climate change, dwindling natural resources, and an already challenging skilled-labor shortage, it seems nearly impossible to address the need to build a global average of 13,000 buildings every day through the year 2050. The current way of doing things simply won’t get us there. 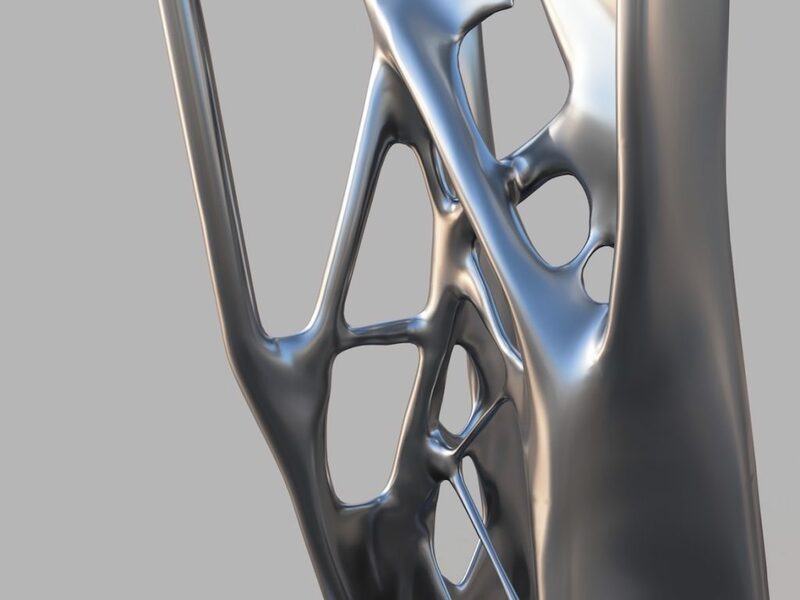 Architects and builders are looking to manufacturing to make the construction process more efficient and repeatable – more connected. At the same time, product designers and manufacturers are learning about the benefits of agility from the construction industry. Industries are converging, and technology is the thread that weaves them together. As we rethink the way we build things, it’s not just optimization, but imagination, that will get us ahead. For the construction industry, imagine what you could do with the ability to make large parts out of steel or other metals right on the spot. What could you do with this technology if it could be available anywhere in the world – even right there on a construction site? We asked this question of our customers, then we went to work making it a reality. Tailored components for tolerance sensitive connections: One of the challenges Dura Vermeer faces is using off-the-shelf components for connecting a glass curtain wall to the steel structure of a building. The glass panes need to be positioned very accurately to avoid shattering. 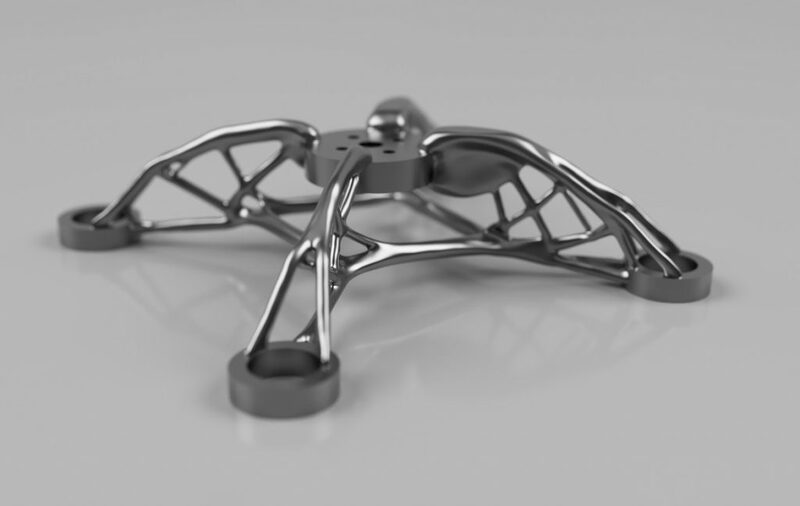 Using generative design and additive manufacturing technology, Dura Vermeer could create a customized “steel spider” connector that could result in perfectly fitting components with optimized weight, that are easy to install and have high architectural quality. Integrated structural components: Dura Vermeer’s second idea is to use generative design to combine 10 separate components into a single component that could simplify their supply chain, minimize the labor needed for installation, and result in components with a higher architectural quality. Redesign complex structural connections into beautiful, holistic nodes: Oftentimes architects and engineers design complex structures that Dura Vermeer needs to cut into parts to be produced by their supply chain, then reassemble them on site. 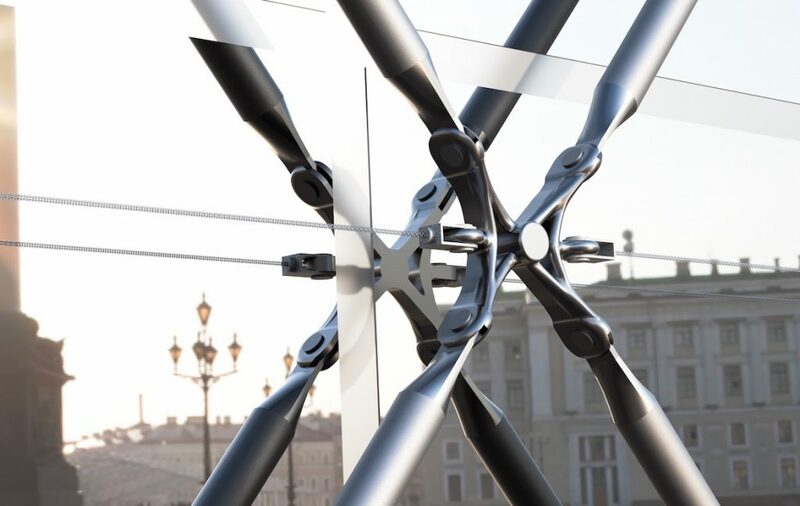 With an additive manufacturing approach at the ready, Dura Vermeer imagines they could solve for such complexity and produce more things on site, such as the connections of a modular dome structure, to become an attractive piece of art inside a building. “Innovating with new technology and embracing industry-leading solutions for construction challenges allows us to bring more value to our customers,” said Ronald Dielwart, member of the board, Dura Vermeer. 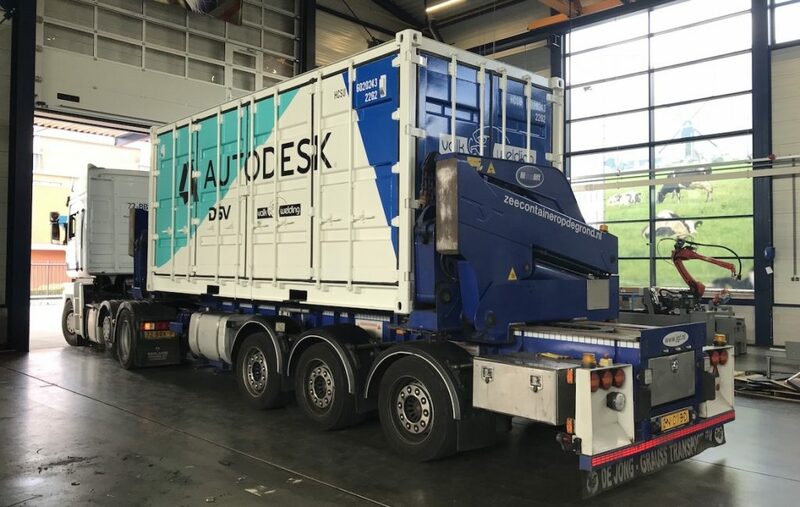 We’ll be showcasing some of Dura Vermeer’s early prototypes, as well as the additive construction shipping container itself, next week at Autodesk University. After that, the plan is to take it on the road in Europe to see how other construction customers might use the technology. We can’t wait to see where our imaginations – and technology – take us next.